There still remain many large numbers of citizen soldiers from various conflicts classified as missing in action. 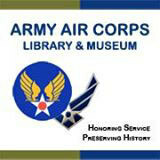 The Army Air Corps Library and Museum is publishing the following ongoing research from the MIA Recovery Network in the hopes that more and previously unknown information may be made available enabling more of those who sacrificed to be fully accounted and recognized. As of its launching, announced December 7, 2017, this material accounted for approximately 25% of the MIAs that still remain from World War II. Search through records of the Army Air Forces Members of Army (including Paratrooper and Armored Divisions), Navy, Marine and Coast Guard MIAs' units are found on our sister organization's website: Sons of Liberty Museum. If you have any information that would assist researchers for any of these cases, please contact us. If you are a family member, we would be honored to receive service photos and other material about your ancestor. As of February 1, 2018 this material accounts for 99% of the MIA from WW2 and also includes missing from WW1, Korea, Vietnam and the Cold Wars.